Register and never see these ads again. I got my new wheels and tires put on. 31s. Still have to install the rear shackles, obviously. Is that a bumper you made or had someone make, or you bought? If you bought it, where?! Looks good!! Thank you. 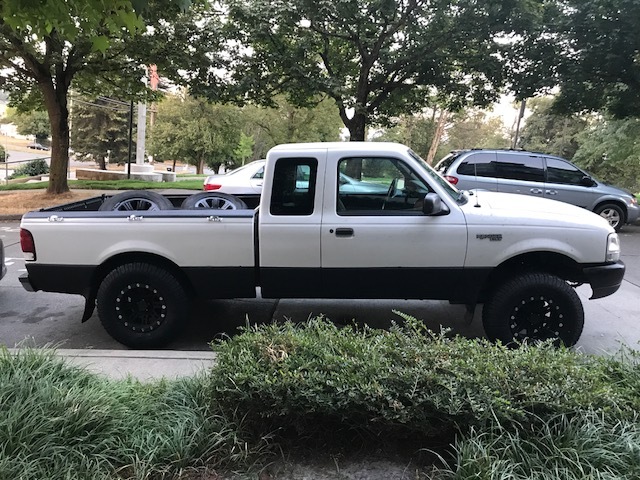 I made-it myself , it's near impossible to find something in that style for Ranger , it became a high clearance bumper by ''accident'' when i find a way to integrate the tow hitch with the offset license plate. 06 mirrors, white face gauges, explorer limited leather seats, shorty console, UWS Toolbox, proper hitch, proper spray in bed liner. I replaced the heater control valve in my 99 ranger 2.5l engine. hopefully its ok I ask a question. it looks like there was an electrical line coming off the bottom of the valve that was cut. does anyone know what that line is called and can it be spliced or do I have to buy a new one. Discovered the left upper ball-joint is pretty well shot. So, I'm going to the front-end shop next week! 2011 XLT 4x4, Super Cab 4.0, auto, General Grabber AT-2s, working on it! I added a manual shift transfer case and FX4 shifters! There’s something very satisfying about shifting in to 4wd with a gear lever.  If anyone has an FX4 transmission shift nob to match my transfer case shift nob, I’d be interested in purchasing. 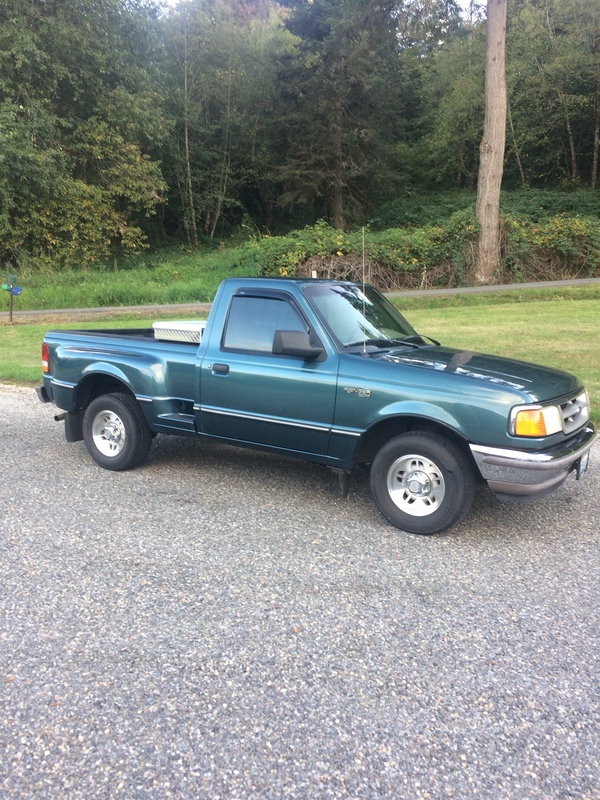 Ford Ranger Edge regularcab, 2003 3.0 manual 4x2, cranked torsion, 2" rear shackles, 33x10.5 bfg AT, 4:10 gears, Powertrax no-slip differential, K&N cold air intake, Flowmaster 50 series cat back dual exhaust, 1:8:1 Morana roller rockers, 60mm throttle body, ported upper intake manifold, Superchips programmer, custom safari topper with black bikini, Thule low rise roof bars, Rola Vortex roof basket. Replaced the left fog light socket. Light was working intermittently and wiggling the wires showed it to be sour. I took mine on a 2900 round mile to Paradise CA and back. Fuel mileage hung around 16 & 17 MPG on the interstates where the speed limit is 80. I traveled out to CA to help my old friends & former neighbors sift through what was left of their homes.....which was nothing. There was really nothing worth salvaging. I've never seen so much devastation. It is hard to imagine 95% of a town of 27000 people wiped off the face of the earth. 2011, 4.0L, 4x4, automatic, super cab. 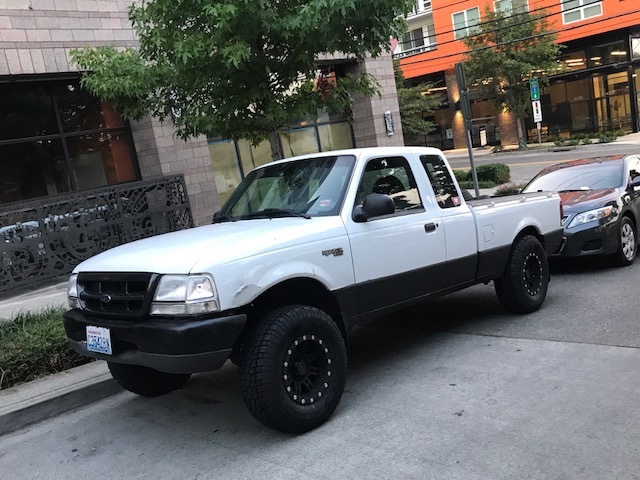 This thread is for the little things that you do to your Ranger on a daily basis. So if you did a simple mod or just changed the oil, tuned it painted some fading black or ordered parts for it post it here. Continuation of the previous thread.... For those of you wondering, this new thread was created after seeing numerous comments that long threads greatly hinder server performance. Last edited by Xltroyboy; 02-27-2019 at 01:05 PM. Replaced the original 9 yr old battery. I've never had an original batt last this long. It wasn't dead, but was getting weak. Got AAAbattery(buit by interstate) 6yr pro rated, 3yr free replacement on sale installed at my house for $117. Starter motor spins a little faster now. finished the paint, put cap back on. (painted it a couple of days ago) love it! 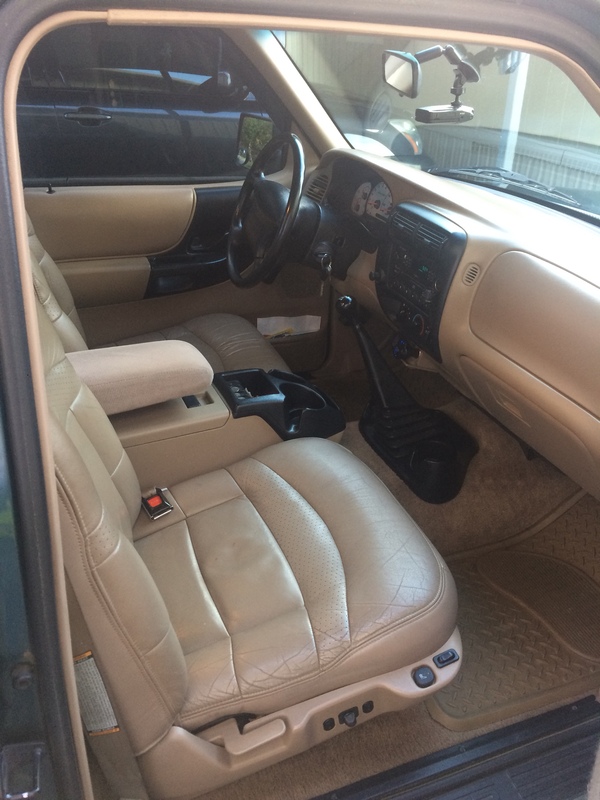 '94 2wd longbed 2.3 manual trans-"R-140"